Order Biona Spelt Pizza Bases from the Online Health Food Store UK. 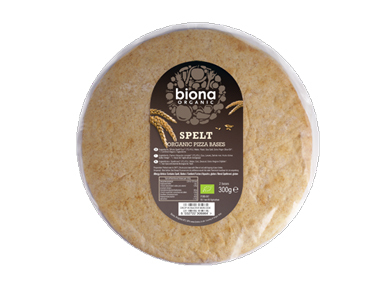 Buy Biona Organic Wholemeal Spelt Pizza Bases - 2 pieces and other quality Spelt & Wheat Pasta safely online in the UK. Spelt is one of the oldest cultivated grains (an ancient cousin of wheat). It is high in fibre, has a higher content of protein and vitamins than wheat and although not gluten free, Spelt can be tolerated by some people with wheat allergies. Spelt pasta is a great, healthy and tasty alternative to wheat pasta. Although spelt is not gluten free, it can sometimes be tolerated by some people with a wheat allergy. Wholemeal Spelt Flour* (70,4%), Water, Yeast, Sea Salt, Extra Virgin Olive Oil*. As official Biona stockist in the UK, we sell quality Spelt & Wheat Pasta to customers throughout the UK in England, Wales, Scotland and Northern-Ireland. View more products on the Online Health Food Store from Biona. Where to buy Biona Spelt Pizza Bases safely online? Shop at the Online Health Food Store if you are wondering where you can buy Biona Organic Wholemeal Spelt Pizza Bases - 2 pieces safely online in the United Kingdom. Our Health Shop is located in the UK and our award-winning independent has been serving customers in England, Wales, Scotland and Northern-Ireland since 1976. You can buy our Organic foods suitable for vegetarians and other quality Spelt & Wheat Pasta online and we post out orders to any UK address. Spelt Pizza Bases - Biona Organic Wholemeal Spelt Pizza Bases - 2 pieces in Spelt & Wheat Pasta and Dried Pasta.